WHERE: Pegram Room at Lincoln Public Library, 725 Pekin St.
WHAT: "Meet the State Candidates Breakfast"
WHAT: Classic Film Night showing of "On the Waterfront"
The Harlem Ambassadors are being hosted in Lincoln by Habitat for Humanity of Logan County. The basketball team will be performing Tuesday, March 5, at 7 p.m. at the new Lincoln Christian College Gaston Arena. Advance tickets are $10 for adults, $7 for senior citizens and $5 for children under 12. At the door, tickets at the door will be $12 for adults, $9 for senior citizens and $7 for children. Tickets can be purchased in Lincoln at the IGA, A.G. Edwards and Union Planters Bank. For more information contact Habitat at P.O. Box 714 or phone (217) 732-6234. You are invited to attend an open house on Sunday, March 3, from 1 to 3 p.m. at the Logan County Courthouse and at the Dr. John Logan County Building, 122 N. McLean St. in Lincoln. Many offices have switched locations within the courthouse, and some have moved to the Dr. John Logan County Building, one block away, across from the Lincoln Public Library. The offices will be open for viewing, and county officials are looking forward to greeting everyone. 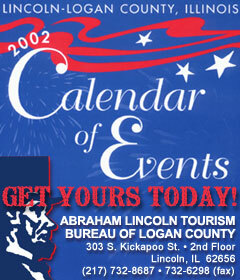 For background information, see LDN posting from Dec. 27, 2001: "County officials trade spaces." Members of local chapters of Beta Sigma Phi have been preparing for their "School Daze" benefit to help cover expenses of the annual school bag project for Lincoln students. Each year students are screened through CIEDC for eligibility for this program provided by Beta Sigma Phi. Students who meet the qualifications are provided with a school bag and all of their school supplies for the upcoming school year. The number of eligible students rises each year. For the 2001-2002 school year, bags and supplies were provided for over 80 children. All proceeds from Beta Sigma Phi yearly projects go toward this program. The benefit dance is scheduled for Saturday, March 9, from 8 to 11 p.m., at the Moose Lodge in Lincoln. This will be an evening for adults, with dancing to the lively tunes of Music 4U DJ Service. There will be a cash bar, snacks, a 50/50 drawing, and door prizes that have been donated by local merchants. When tickets are presented at the door, they will automatically be entered into the drawings for door prizes. Winners for the door prizes need not be present to win. Tickets are being given away in advance from local members and at MKS Jewelers on the square. Complimentary tickets will also be available at the door. Donations are accepted and appreciated. If you would like to obtain tickets or donate a door prize, please call the following Beta Sigma Phi officers: Janet Henrichsmeyer, president, 732-7146; Linda Sue Sheley, vice president and treasurer, 732-8610; or Tish Podunajec, secretary, 735-1085. This is sure to be an evening enjoyed by all, and the children of Lincoln who will receive much-needed school supplies will certainly enjoy the benefits from the evening! The 2002 Miss HOI Scholarship Pageant is set for the evening of Saturday, April 6, at the Bertha Frank Performing Arts Center of Morton. The program is sponsored by the Morton Area Players, the Morton Park District and Bearce Automall of Washington. Entries are now being accepted from young ladies ages 17 to 24. Applicants have a chance to be the next winner of thousands of dollars in scholarships and to represent our area at the Miss Illinois Pageant in June. Bethany Von Behren of Peoria, Miss HOI 2000, won more than $6,000 in scholarships through her competition at Miss HOI and Miss Illinois. Von Behren is a 2001 graduate of Illinois Wesleyan University in Bloomington and was a top ten finalist at Miss Illinois. She was also a preliminary talent winner. This year’s show, "Celebrate America," will feature award-winning twirler Alyssa Gunderson, the current Miss Heart of Illinois. Gunderson is a special education teacher in suburban Chicago and has been volunteering for mentoring programs for the past five years. She has worked closely with the Bloomington Housing Authority and has started mentoring programs in four states. Gunderson is a 2001 graduate of Illinois State University. The Miss Heart of Illinois program was honored at the state level for the quality of its show on pageant night, winning the Best Production Award in 2001. In 1999 and 2001, it won the inaugural Outstanding Program Award from Miss Illinois. Since 1998, it has awarded approximately $26,000 in cash scholarships to central Illinois women, thanks to area sponsors. Scholarship funds are sent directly to the contestant’ s university to pay for tuition only. For more information on entering, sponsoring or volunteering for Miss HOI, e-mail misshoi@hotmail.com or visit the official Miss Heart of Illinois website: misshoi.homestead.com. The Lincoln Writers’ Club will meet at 6 p.m. on Tuesday, March 5, in the Pegram Room of the Lincoln Public Library, 725 Pekin St. Anyone interested in writing is invited to attend. For further information, you may call Rebecca Johnson at 732-2723. Join us Wednesday, March 6, at 9 a.m. for an informative meeting with Jim Griffin, who will discuss Logan County Board issues. Everyone is welcome. The committee is now accepting your "gently used items" to be auctioned. Please bring the donations to the Oasis on Monday or Wednesday from 10 a.m. to 1 p.m. Thank you in advance for your support. The second annual auction will be at 10 a.m. Saturday, March 16. On Monday, March 18, at 1:30 p.m. ASTA Care Center will sponsor a celebration for all members who have March birthdays. Mark your calendars in advance to join us for games, prizes and birthday cake. The weekday pinochle winner for Feb. 15 was Easter Behrends. Eleanor Barton won on Feb. 19. Weekend game winners for Feb. 15 were Millie Hoffert for pinochle and Tom Garrison and Henry Warnisher for 5 in 1. The Lincoln Rotary Club recently presented a check for $400 to Boy Scout Troop 102 to assist with the purchase of a new engine for their troop bus. Pictured from left to right are Assistant Scoutmaster Jim Meyrick, Lincoln Rotary Club Director of Vocational Service Joe Runyon, Scout Joe Gillen, and Troop 102 Scoutmaster Ken Aderman. The Rotary contribution, along with donations of peripheral equipment from Graue Chevrolet and profits from a troop chili supper, will help Troop 102 finance the cost of the new engine. Troop members will install the new engine on March 16. Profits from Rotary’s annual citrus sale are used to financially support special projects of several community organizations. Lincoln Rotary also awards $3,000 in scholarships to LCHS graduating seniors each year and works directly with local youth in a number of activities. The Lincoln Rotary Club, which is 65 members strong and growing, will coordinate a special literacy activity on Friday, March 1, at approximately 12:30. Twenty Rotarians will read their favorite books in classrooms at Northwest and Jefferson Elementary School. The club will also make a special presentation of books with patriotic themes for use in all District 27 school libraries. Lincoln Rotarian Robert Parrish and his wife, Wilma, were honored Feb. 20 with a second Paul Harris Fellowship from Rotary International. Robert Parrish first earned recognition as a Paul Harris Fellow in June 1992. Past District Governor Dan Thornburgh of Charleston awarded Wilma Parrish a Paul Harris Fellowship in appreciation of her husband’s three years of service as an assistant district governor in District 6490. Assistant district governors, or ADGs as they are more commonly known in Rotary lingo, provide direct guidance to a small group of Rotary clubs within each district, ensuring that clubs focus on programs and projects that are consistent with the goals of Rotary International. Parrish’s group of clubs included Atlanta, Bloomington, Bloomington-Normal Sunrise & Sunset Clubs, Clinton and Lincoln. Parrish has been very active in the Lincoln Rotary Club since joining in 1981 at the request of Fred Hoppin. He was club president in 1991-92 and currently serves on the District 6490 committees for group study exchange, leadership succession and development, and annual giving. The Paul Harris Fellows program recognizes Rotarians who have made gifts of $1,000 or more to the Rotary Foundation to support good-will projects around the world. The Lincoln Rotary Club currently has 21 members who are Paul Harris Fellows out of a total membership of 65. The local office of the University of Illinois Extension is hosting a series of educational presentations. Anyone and everyone is welcome. Programs will be at the Extension office at the northwest corner of the fairgrounds, 980 N. Postville Drive. Reservations will be requested; programs will be cancelled if fewer than 10 people are registered. The Lincoln Area YMCA’s sixth annual charter dinner and auction is taking on a whole new look and feel for 2002. Instead of the usual springtime date, it has been moved to the fall — Sept. 21. The location has been changed to the Knights of Columbus. The theme for this year’s auction is "Community…It’s not the same without the Y. Pulling together for Logan County." Every year the auction has brought in additional money for programs. This year the goal is to raise $21,000 for programs for youth and families. If you would like to make a donation to the YMCA for the auction or if you would like to be on an auction committee, please contact the YMCA office at 735-3915 or (800) 282-3520. The survey of 500 teens 14 to 17 years of age reveals a strong interest in community and neighborhood-based after-school programs. Even though many teenagers participate in after-school programs through their school, over half of all teens (52 percent) wish there were more community or neighborhood-based activities available. And, while more than 62 percent of teens left alone during the week say they would likely participate in after-school programs, the survey also found that two in three teens (67 percent) would be interested in programs after school that would help them get better grades, develop leadership skills and be more involved in the community. Cornelius Abraham is a teen who says he’s the perfect example of how the YMCA programs can keep good kids from going bad. At a news conference on Capitol Hill, Abraham described how he came from a family broken apart by the violent death of his brother at the hands of his parents. "The YMCA was a haven for me in my childhood and teen years. Without the structure and support I found through the Y’s after-school programs, I would never have had the success I did in school and confidence to overcome the obstacles in my path." said Cornelius, a former Chicago YMCA teen and now a 20-year-old sophomore at Northern Illinois University. Jessica Stone is another good example of how YMCA programs work. The 14-year-old from Seattle, Wash., comes from a strong, two-parent family. "Being involved in the girls’ leadership program has been a great experience. The mentors I’ve worked with have really helped me learn and think about my future, and now I’m able to help other kids as a mentor for them," said Stone. Keeping teens out of the "danger zone"
Unsupervised teens are in the "danger zone" — the hours of 3 to 6 p.m. after school, when being unsupervised can lead to problems with alcohol, drugs, sexual activity and even crime. This danger cuts across race, income and family structure, as was found in the University of Minnesota’s National Longitudinal Study of Adolescent Health, the largest-ever survey conducted with adolescents in the United States. Teens who are failing school and "hanging out" with friends are more likely than other teens to engage in at-risk behaviors. "If we choose not to invest in addressing the unstructured, unsupervised time of teens, it does not mean that we are saving money. We can pay at the front end or we can pay at the back... but we will pay," said Dr. Robert Blum, co-principal investigator of the University of Minnesota study. The YMCA’s "After School" survey also revealed that teens who participate in after-school activities do better in school and are less likely to engage in activities that place them at risk. Teens who do not engage in activities after school are five times more likely to be D students than those who do. Furthermore, nearly eight in 10 teens (79 percent) who participate in after-school programs are A or B students, but only half (52 percent) of teens who do not participate earn such high marks. To date, more than 1,000 YMCAs have signed on to support the YMCA Teen Action Agenda, In addition to doubling the number of teens they involve in programs, these local YMCAs pledge to offer more programs and support for teens. Meeting the campaign’s goals — building teens’ skills and values, developing assets in teens, providing teens with meaningful roles in their communities, and placing teens with adult role models — is crucial to teens’ success. "YMCA teen programs provide teens the safe, structured after-school activities that help them avoid risky behaviors while preparing them academically and socially and building the character and skills teens need to succeed and thrive as young adults," said Kenneth Gladish, Ph.D., National Executive Director of YMCA of the USA. In 2001, America’s YMCAs celebrate the 150th anniversary of the founding of the first Y, in Boston, Mass. One out of three Americans reports being a YMCA member at some point in life. Together the 2,372 YMCAs are the nation’s largest not-for-profit community service organization. Today, America’s YMCAs serve 17.5 million people, including nearly nine million children each year, through a broad range of programs, including mentoring, youth leadership and volunteerism. Collectively, YMCAs are also the nation’s largest provider of child care. YMCAs are for people of ail faiths, races, ages and incomes. Financial assistance is available for all YMCA programs and membership. To learn more about the YMCA, visit the website at www.ymca.net. The YMCA Teen Action Agenda is sponsored nationally by JCPenney Afterschool and PepsiCo, Inc. Note: The survey results are based on telephone interviews with a national sample of 500 teenagers, 14 to 17 years of age, conducted in January 2001 by Penn, Schoen & Berland Associates of Washington, D.C. The statistical significance of the results is plus or minus 4.4 percent at the 95th confidence interval level. The YMCA Art Outreach program is designed to reach youth of junior and senior high ages, giving them a positive outlet to express themselves and to keep them off the streets during the hours when they seem to get into the most trouble — after school. The YMCA accepts referrals from schools, churches and the court system for any at-risk youth that might benefit from the organization’s programs. The Y sets up contracts with area youth, addressing where they are having problems. The youth must maintain the contracts in order to continue in the program at no charge. Five AmeriCorps volunteers who are experienced in several areas of the arts have helped with the program this year and have been great assets. Regular classes have been offered since last September. The program began with a six-week mosaic tile class. At first the class met in Mrs. Sisk’s art room at Lincoln Junior High School, which was convenient for the junior high youth to attend right after school, but it wasn’t long before the program outgrew the art room. The group needed a place for classes and space for studio work — a place to call their own. The YMCA found that place at the old Odd Fellows Gym. At first the group used the girls’ dressing room upstairs at the entrance of the gym. The walls were lined with shelves to the ceiling in order to hold art supplies that have been bought, donated and pulled out of the trash. (Yes, trash beside the road or in a dumpster is picked up if it might have potential for being turned into artwork.) So the class outgrew the new space rapidly and soon started occupying the boys’ dressing room. Now the program has one room for storage of all the supplies and a small work area, potentially to house a small printmaking press for etching and a mat cutter. The youth will be taught how to mat and frame their own artwork. The other room is used as a working studio. Since September, the art program has offered five other classes: cartoon animation, painting, mixed media, papermaking and photography. Prospective spring classes are on ceramics and printmaking. A photography class is on hold until a program sponsor and a darkroom can be found so that the class can move on to the next level. The YMCA would be grateful to anyone who has any old 35 mm SLR cameras, tripods, filters or lenses to donate to the program. The program is always looking for any useful donations — the possibilities are endless. Even though you think it might be trash, you might want to think again and call Shanda at the YMCA, 735-3915. It just might be a treasure to the art program. And if you see a woman in a blue van pulling things out of the trash, just remember it is for a good cause. "School’s Out Fun Days," offered by the local YMCA, are just the right answer for both parents and their children ages kindergarten through sixth grade. Parents can preregister their children to attend these special days and go to work knowing that the children will be kept busy and safe on days when school is not in session. Kids especially enjoy their day off from school, as they have lots of opportunity to socialize and play games with their school friends. Youngsters will also enjoy the benefits of a variety of planned special activities and lessons at each Fun Day. Some of the special activities are singing fun songs, enjoying story time, experiencing science lessons, art activities and lots of fun large-motor play. Various guest speakers visit from time to time to share healthy nutrition programs and other interesting information with the children. All of the School’s Out Fun Days are at the YMCA activity center, 721 Wyatt Ave.
[FEB. 28, 2002] Just over 10 years ago, in 1991, Judy Awe decided her family needed a way to remember its heritage. Judy Awe is a member of the Ritchhart family, a family known all over central Illlinois. The Ritchhart family includes two men who fought in the Civil War (one of whom died in that war) and one man who fought in the Spanish-American War. Judy is the oldest grandchild of Harold Raymond Ritchhart and Wilma Amaryllis Shay, both of whom were born in Logan County. Harold owned Ritchhart’s Grocery for 48 years. Judy has fond memories of working in the store learning to count change. Her grandparents really defined the Ritchhart sense of community awareness. And she wanted to create something in their honor. With an extensive family of eight children and 29 grandchildren, not to mention cousins, the Ritchharts had many, many recipes to share. Some had stories or meanings behind them, some were just family favorites. The ones collected from "Gran" (Wilma) Ritchhart were the hardest, according to Judy. With other members of the family, they simply had to copy the recipe down onto a form and mail it back. Gran, however, cooked the old-fashioned way — "some flour, a lump of butter, a little bit of baking powder." So Judy and her sister had to measure the ingredients and write them down as she put them in. Her recipe for dumplings turned into "2 C. flour, 2 tsp. baking powder with little salt, 1 heaping T. Crisco." In addition to recipes, Judy collected stories from her mother and others. These were used as filler material at the bottoms of the pages. A reader can get great enjoyment by just scanning the bottom of each page for anecdotes. Some have to do with food and recipes: "How many ways can you cook an egg? Ask the kids at Jellystone Campground." Some make you almost wish you knew the story behind them: "Is Judge John’s blood still on the porch at [the house] at 123 [College]?" And some just make you laugh: "Dad was a volunteer fireman for several years. One night, the boys pushed the car out of the garage and down the alley without Dad’s permission and went cruising. When they saw the fire they knew Dad would be called, but they had his car, so they went home to pick him up…sleepy eyed, Dad didn’t realize it was his car that was delivering him to his destination – until later." So they collected all of these recipes from relatives and sent them off to be published. Since that time, there have been many reprints of the cookbook. More and more members of the Ritchhart family want their family’s recipes, and many members of the community also want to be a part of the history. Eventually, over 4,000 copies of the book were sold. The money from the first book was given to Abraham Lincoln Memorial Hospital Auxiliary in Lincoln. It was used to purchase Lifeline units. But, as with all compilations, many recipes were left out. Some had merely been forgotten or overlooked. Others came along later as the over 30 great-grandchildren began to grow up. On the 10th anniversary of the first Ritchhart cookbook, Judy decided it was time for a second one. "A new century, a new generation and new recipes!" she proclaimed. And she went back to work. The Ritchhart family really had grown. It included almost everyone needed for a modern community, from doctors to firemen to a school administrator. Everything but a lawyer, according to Judy. So her table became covered with new recipes, old recipes, forgotten recipes. She collected new sayings and stories. She arranged and rearranged them all. And finally, at the beginning of September 2001, the book was ready to be sent off. She writes in the introduction to this cookbook, "Final touches were being made on Cookbook 2001 – September 11, 2001, when our nation was devastated by terrorists attacking the New York World Trade Center." But even the terrorists could not hold back the Ritchhart cookbook. Judy called the publishing company and asked if they had a patriotic cookbook theme. The sales representative laughed and told her that one was being prepared as they spoke. The American flag and eagle design was sent to Judy as soon as it was printed. She chose it immediately, and her book was the first one published in that style. The back of the book reads, "This cover and divider set was designed to honor the victims of the September 11 tragedies. For every set sold, G&R Publishing has made a donation to the New York Fire Fighters 9-11 Fund." In addition, Judy will once again donate the proceeds of this book to a charity or need somewhere in this area. If you would like to purchase one or both of these cookbooks, you can contact Judy Awe at (217) 732-4758 or e-mail her at tjawe@abelink.com. Books are $10 each plus $4 if you want them shipped to you. Click here for a copy of the "Rattlesnake and Beans" recipe from the new "Ritchhart Family & Friends Cookbook." Put cooked beans into slow cooker; add tomatoes, jalapenos, onion, salt, garlic, cooked ground chuck and rattlesnake meat. Cook on low for 2 to 3 hours. Serve with corn bread. At Atlantic Fleet Headquarters, Norfolk, Va.